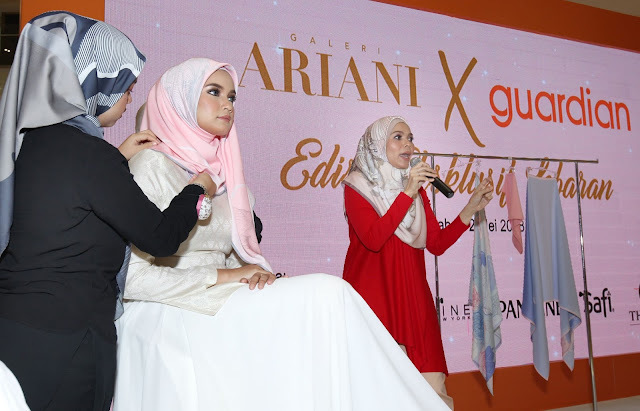 In the first partnership of its kind, leading health and beauty retailer Guardian Malaysia and Ariani, a premium brand in headscarf fashion, have produced an exclusive and delightful “Lebaran Edition” for Ramadan and Hari Raya. Available exclusively to Guardian Malaysia customers, the “Lebaran Edition”, is made from quality material, and comes in four designs inspired by Malaysia’s flora, in colours currently in vogue. During the two-month promotion (from 1 May to 27 June) the scarves can be purchased at half the recommended retail prices. At prices ranging from RM29.90 to RM89.90, they represent a discount of between 54 and 57 per cent. 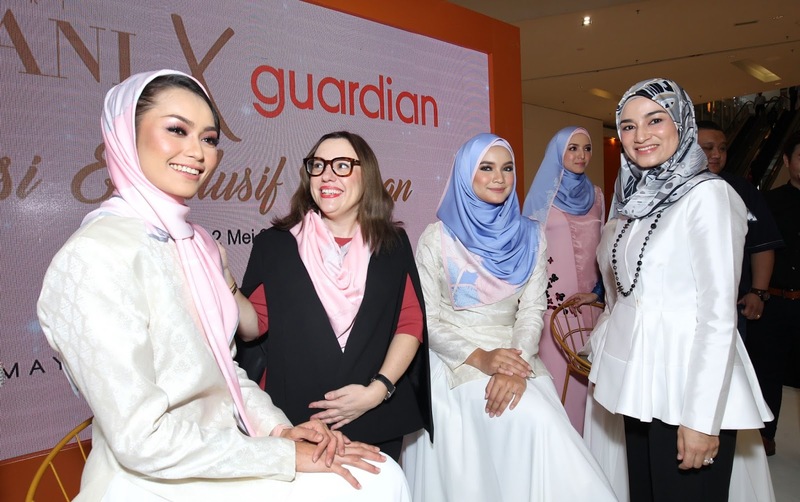 Speaking at the launch today, Ms. Anna Hull, Merchandise Director of Guardian Health And Beauty Sdn Bhd, said: “We are rolling out the specially designed items, just before the holy month of Ramadan, to ensure our customers can get their hands on these delightful, quality scarves and shawls in time for the Hari Raya celebrations. 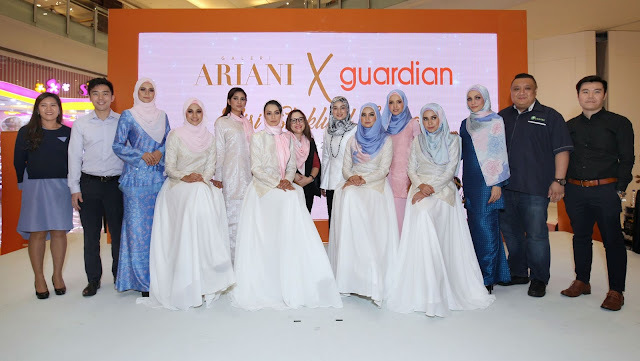 On the rationale for the collaboration with Ariani, Anna said: “Though Guardian Malaysia is primarily a health and beauty brand, we have made it our policy to put our customers first, always. In planning for Ramadan and Hari Raya, we believe our customers would love to own some of the nicest headscarves they can find in this country; and more importantly, at prices that are real value for money! “There is no minimum purchase requirement. A customer only needs to purchase an item from one of our many participating brands to be entitled to purchase any of the headscarves. Even if you do not get one for yourself, they make delightful gifts anytime for the female gender,” she added. Datin Farah Haryani, Marketing Director of Ariani, giving an insight into the partnership and exclusive designs, said: “The notion of beauty from within through the use of the products in Guardian stores is now further enhanced with the donning of the Ariani headscarves, all of which are available for grab under one roof!” She said, Ariani, a subsidiary of the JAKEL Group has crafted “Lebaran Collection” headscarves with immaculate details in mind, and they are designed to fulfil the three core elements – exclusivity, demeanour, and contemporary. They come in four wonderful designs, with “Blooming Flowers” as its theme. 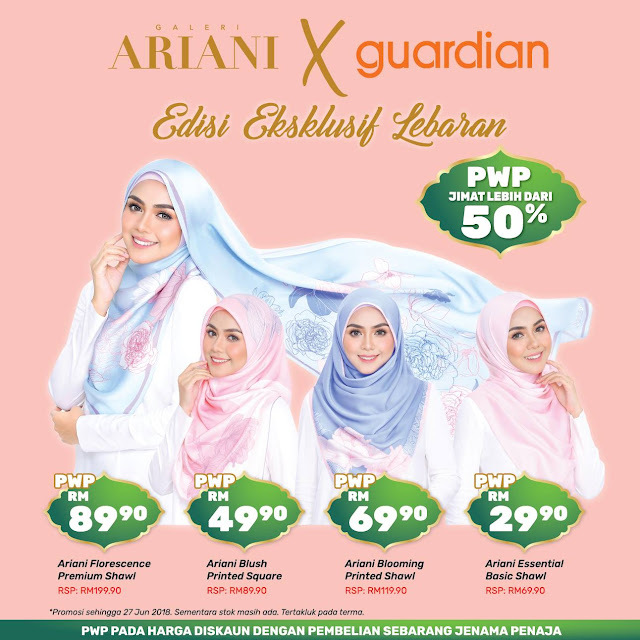 They are available in Essential Basic Shawl (Plain), Blush Printed Square (Square), Blooming Printed Shawl (Shawl), and the cream of the cream, the Florescence Premium Shawl. For every purchase of one participating brand, the customer is entitled to buy one scarf per design. In other words, the customer is entitled to buy a total of four scarves, i.e. one of each design. The customer who buys products from two participating brands, is entitled to buy two scarves per design. Among the main participating brands are: Dermo Expertise, Maybelline, Pantene, Safi, and Thymos.